Nov. 27, 2017 9:44 a.m.
One person was injured in a four-vehicle crash Monday morning on 264 Street, the road that leads to the Aldergrove border crossing. 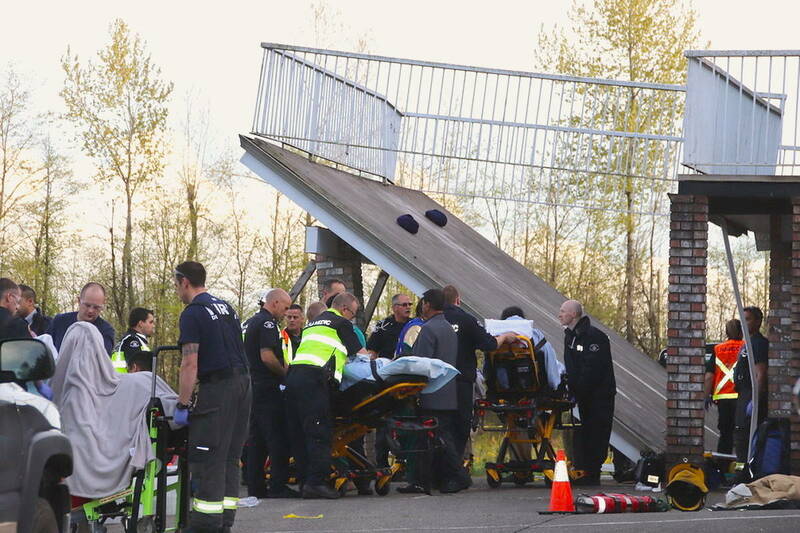 Langley RCMP said the female driver of a Chevy Tahoe was transported to Royal Columbian Hospital with what were considered non-life-threatening injuries after she tried to cross 264 Street heading east on 24 Avenue. The Tahoe failed to clear the intersection and collided with a Ford flatbed truck that was towing a trailer. Two other vehicles, including a large panel truck, were also hit. Traffic on 264 between 16 and 24 Avenues was initially restricted to a single lane, then blocked off altogether while accident investigators went over the crash site. Area resident Geoff Bardal, who lives on 264 Street not far from the intersection, heard the “all-too-familiar” sound of a large truck braking just before the sound of the crash. “We hear the brakes screeching almost every weekend, Bardal told the Times. He said speeding is contributing to the hazard, with drivers going well over the limit heading to and from the Aldergrove border crossing. He would like to see some form of warning lights on 264 in addition to the stop signs on 24 to let drivers in a hurry know they are approaching an intersection.